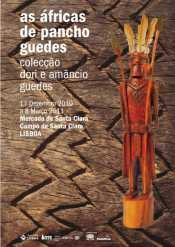 A new exhibition - African Masks and artifacts from the collection of Pancho and Dori Guedes. Order - The catalogue can be ordered here or at the exhibition. Almost finished and for sale in Parkview, Johannesburg, South Africa! An architectural masterpiece by Pancho Guedes. There are two buildings – totalling over 350 square metres with open terraces and roof access in a secure complex of seven houses with views of treetops and a lake. 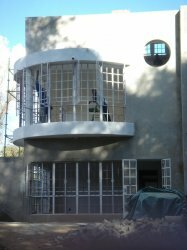 The approx 6m x 6m two level building with roof access wraps around a spiral staircase tower. 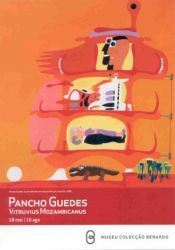 Exhibition - The largest retrospective exhibition of Pancho Guedes work to date. It was at the Centro Cultural de Belém, Praça do Império, 1449-003, in August 2009. The exhibion showed architecture, painting, sculpture, drawings, sketches, models and photographs of work from the 1940's to the present, and is curated by his son, Pedro Guedes of the University of Queensland in Australia. To get an idea of this exhibition, David Crofoot photographed it and here is an album / slide show made from his photographs.